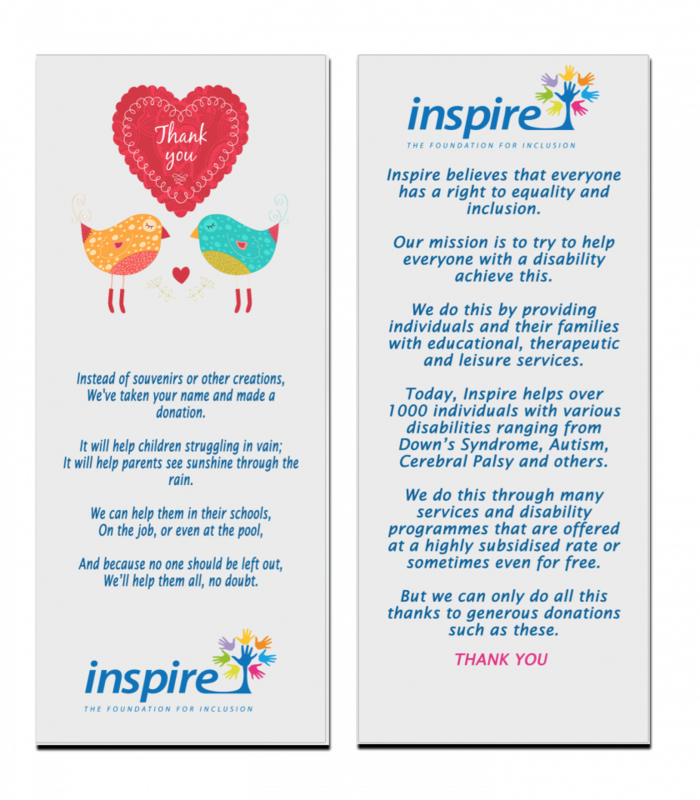 Inspire’s souvenir bookmarks are ideal for Weddings, Wedding Anniversaries, First Holy Communions, Confirmations, Christenings, Graduations, Birthdays and Engagements. They are also environmentally friendly and will NEVER be forgotten or thrown away. 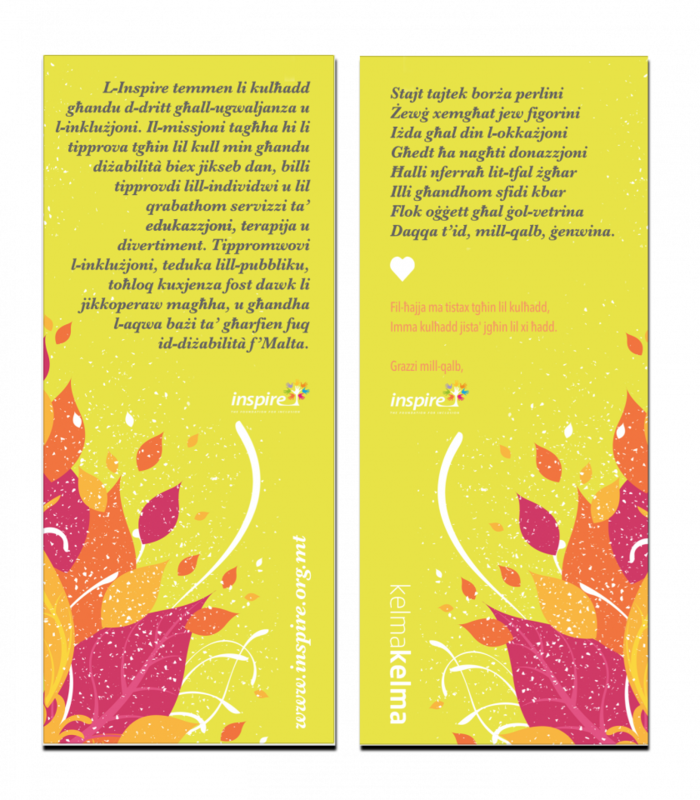 When you choose these bookmarks as souvenirs for your special occasion and make a donation to The Inspire Foundation (€1 per bookmark) you will receive these bookmarks to distribute to your guests as souvenirs and a certificate of appreciation for your kind gesture. The bookmarks explain your kind gesture and family & friends will have something to take home with them as a memory of your big day. 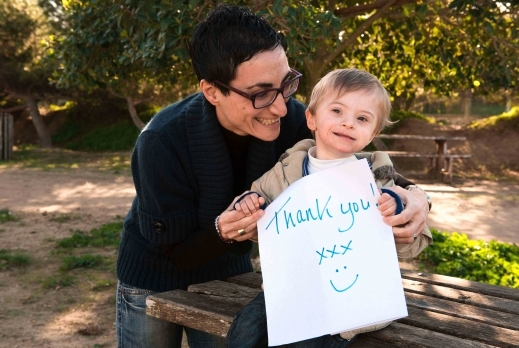 The Inspire Foundation works with chIldren & people with disabilities. We help them and their families cope & also reach their full potential. We do this by providing educational, therapeutic & leisure services. We also advocate for inclusion, educate the general public, raise awareness among peers, and hold the best knowledge base on disability on the island. Today, Inspire helps over 1000 individuals with various disabilities ranging from Down Syndrome, Autism, Cerebral Palsy and others. What do people think about Inspire? Our son Finn, is a happy boy who loves to run, play & swim; he also has autism. Finn was non-verbal until the age of three. He is now 5 & has emerging language using singular words. Finn receives one to one tutorage at home from Inspire, which means we get to watch & learn too. Inspire has given us hope that we will get there. He also attends a mainstream school. With the help of his amazing LSA and friends he is learning to play and how to manage being in a classroom with all that noise. 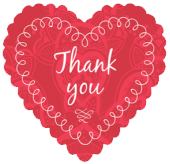 Autism is just one of the many special needs for which Inspire provide help & we are constantly grateful to donors, volunteers & all those who somehow or another help in making this service possible. I’ve been going to Inspire since I was very young & I’ve always enjoyed my time there. It’s not just about the training & the learning, but also about the friends I made, the people I meet & the fun we have working. The teachers are always very nice even though they can be strict, but this is what made it possible for me to find a job & be as independent as I am today. We gave out Inspire’s bookmarks as souvenirs for our daughter’s christening. For our daughter’s christening, we chose to make a donation to The Inspire Foundation instead of spending money on souvenirs that usually end up carrying dust. Our guests were thrilled with the idea. They thought it was orignal and a very thoughtful gesture. They cherised the bookmarks that we distributed and felt honoured that we made a donation to Inspire in their name. If you’re getting married, celebrating your birthday, or even an anniversary, graduation or any other important day with friends, choose one of our bookmarks as souvenirs. Donations (€1 per bookmark) go towards supporting Inspire’s disability services for both children and adults.